Agency of tourist transport specialized in the excursions, the transfers and the organised trips. 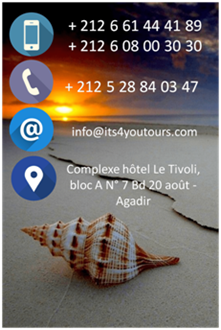 IT'S 4 YOU TOURS is a tourist agency based on Agadir, which makes a commitment to manage the holidays of your dreams in Morocco. Allying professionalism and concerns of the detail with the help and the support of a dedicated, motivated, dynamic team to the complementary talents, our job rests on quality services. Our philosophy? TRAVEL THE FREE SPIRIT! IT'S FOR YOU TOURS is a company specialized in tourist and personal transport since 2007. Our seniority makes of us of inescapable experts on the market of the Moroccan tourism. Indeed, our dynamic and qualified team groups, from the beginning of our activity, the most competent professionals of the Kingdom. How can we work in the tourist sector without passions? It is with an enormous pleasure that we partagons with you our knowledge to be discovered one of the most beautiful countries of the world that is Morocco. Landscapes, cultures, traditions, gastronomies... You will know EVERYTHING about Morocco. More language barrier, we shall be there to facilitate and deepen the approach and the meeting with the population among which the hospitality and the smile are their philosophies of life. As says it so well our slogan " Travel the free spirit ", our major objective is to make you benefit from a journey with no problem at all so that you lived only pleasant moments. Safety and comfort gives rhythm to our transport. 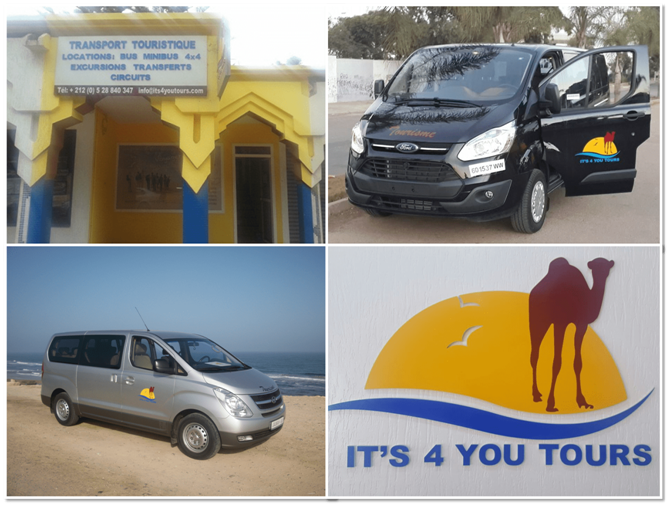 Everything was implemented for you facilitated the life during your holidays: welcome from your arrival to the airport, tranfert up to your place of residence, transport and guide towards numerous destinations everywhere in Morocco, activities and excursions for all the tastes. In family, between friends, in a group or only, trust IT'S FOR YOU TOURS to discover Morocco differently, without stress or problems. Our ambition is to create a real added value, for our customers as for our staff. We have a team specialized in the exercise of every job by the Tourism and by the journeys. Offer a range of products adapted to companies, to private individuals by emphasizing all the tourist wealth of the country. That it is about individual traveler, about group or about incentive, we know how to make of Morocco a magic destination. The diversification of our markets, the selection the best products and the persons receiving benefits, the appeal to the most recent equipments, the optimization of our times of answers and the quotations, are commitments which allow us to forge ahead.